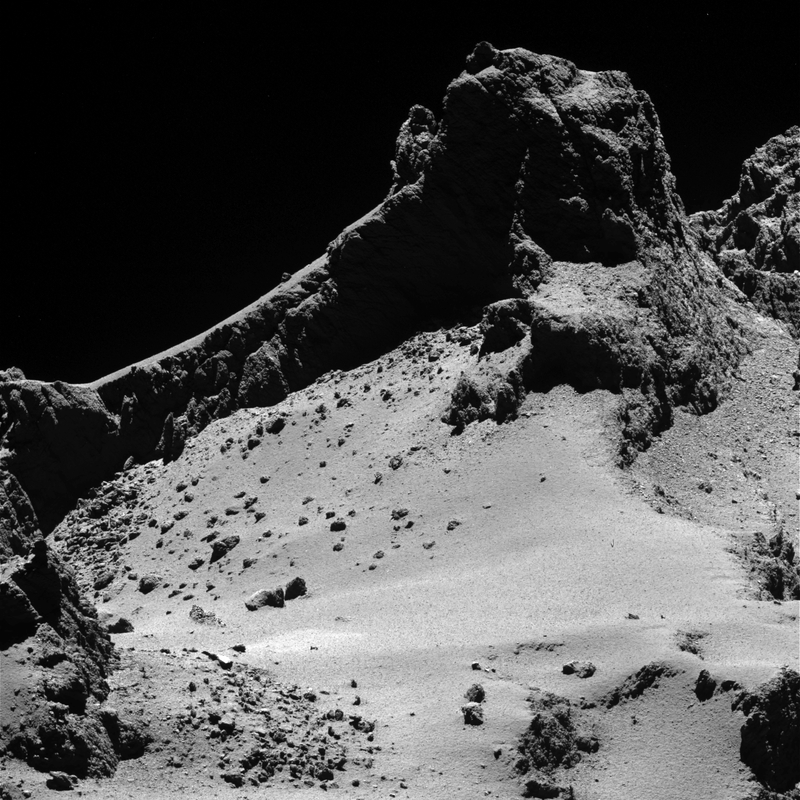 Many of the images we have been seeing of Rosetta’s comet – 67P/Churyumov-Gerasimenko, or 67P for short – have been captured with the spacecraft’s NavCam instrument. 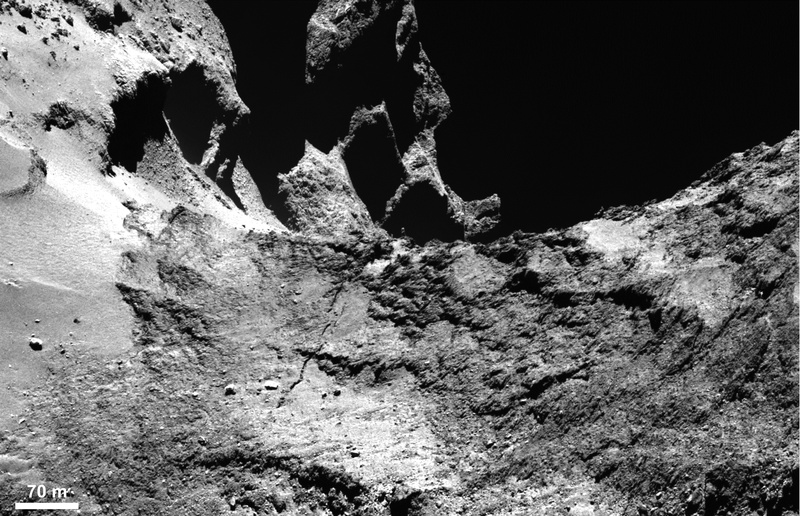 And while they have been amazingly beautiful in their own right, NavCam isn’t Rosetta’s best camera; that distinction goes to OSIRIS, the Optical, Spectroscopic, and Infrared Remote Imaging System experiment that captures both wide- and narrow-angle high resolution images for scientific study. 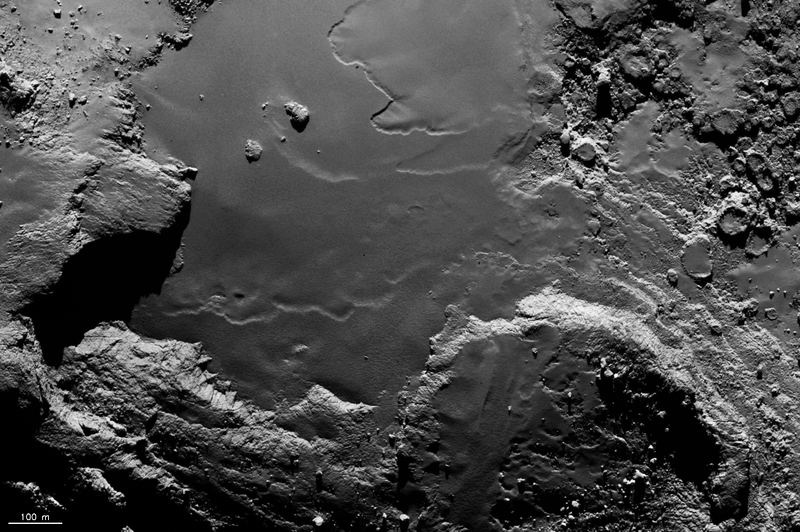 Now OSIRIS images of 67P have been few and far between since Rosetta arrived, mostly because the instrument is not run by ESA but rather by the Max Planck Institute for Solar System Research in Germany and a rather large international consortium of research groups, and they have first access to the data and decide when images will become publicly available. 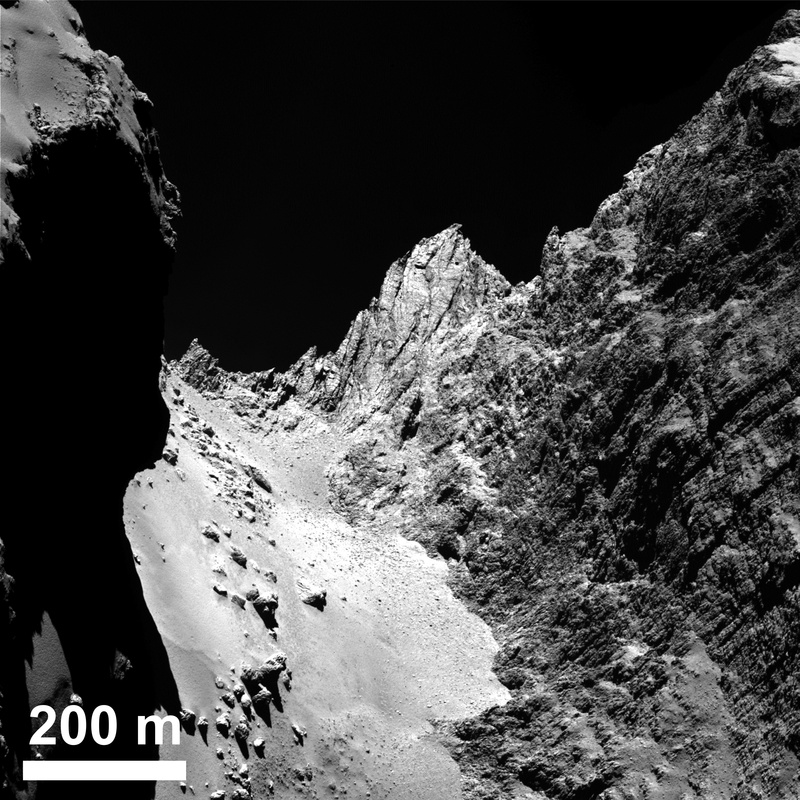 While it’s very common in space science to allow time for researchers to work privately with their own data for a period of time before it gets spread around, it can be frustrating for those who know there are fantastic images waiting to be seen (of, say, the surface of a comet) that are just out of reach! So today the OSIRIS team threw us all a few bones, images that show the surface of 67P in stunning detail that the hardworking but lower-resolution NavCam could never deliver. Above is one, and there are even more below – check ’em out! And if you had any doubt that this was indeed an alien world, OSIRIS has found some weird textures on the sides of slops and craters they are nicknaming “goosebumps.” The cause of their formation is not yet known. 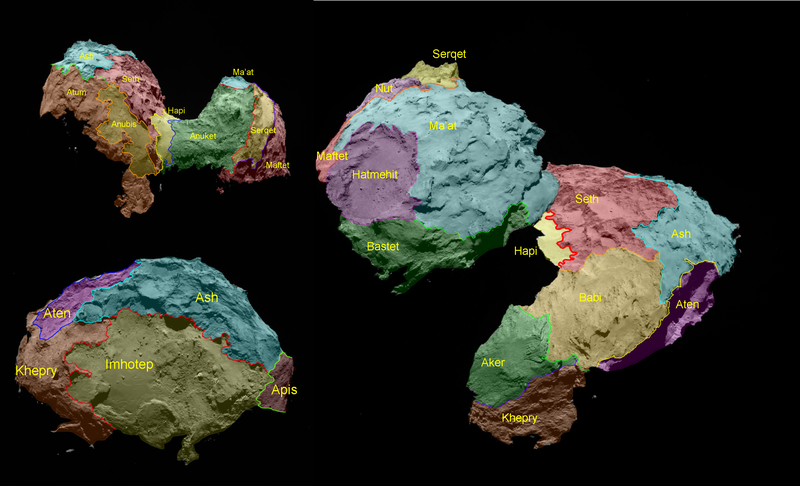 19 regions identified on 67P are separated by distinct geomorphological boundaries. They are grouped according to the type of terrain dominant within each region. Five basic categories of terrain type have been determined: dust-covered (Ma’at, Ash and Babi); brittle materials with pits and circular structures (Seth); large-scale depressions (Hatmehit, Nut and Aten); smooth terrains (Hapi, Imhotep and Anubis), and exposed, more consolidated (‘rock-like’) surfaces (Maftet, Bastet, Serqet, Hathor, Anuket, Khepry, Aker, Atum and Apis). Credit: ESA/Rosetta/MPS for OSIRIS Team MPS/UPD/LAM/IAA/SSO/INTA/UPM/DASP/IDA. 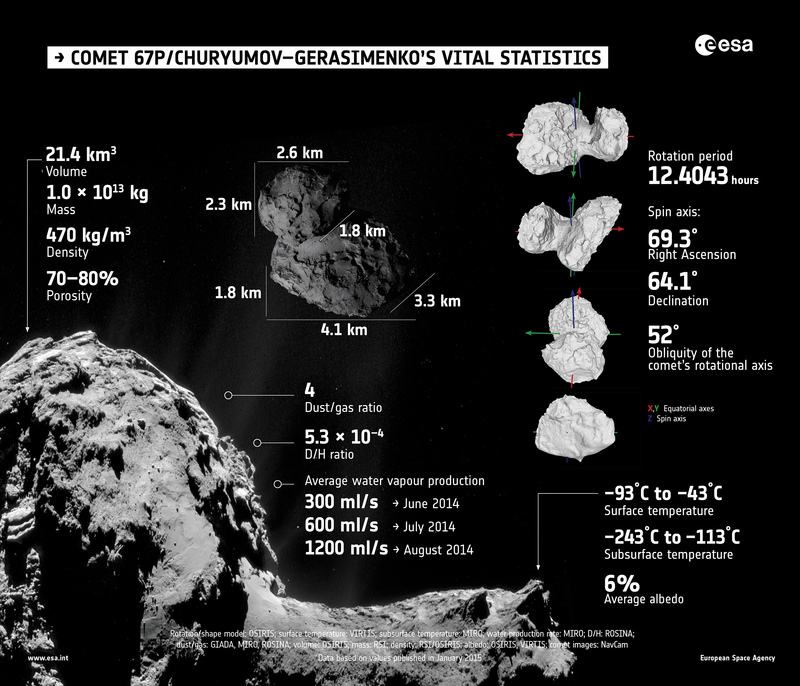 In addition we now have some vital stats on the comet, including its size, density, porosity, rotation, and others. 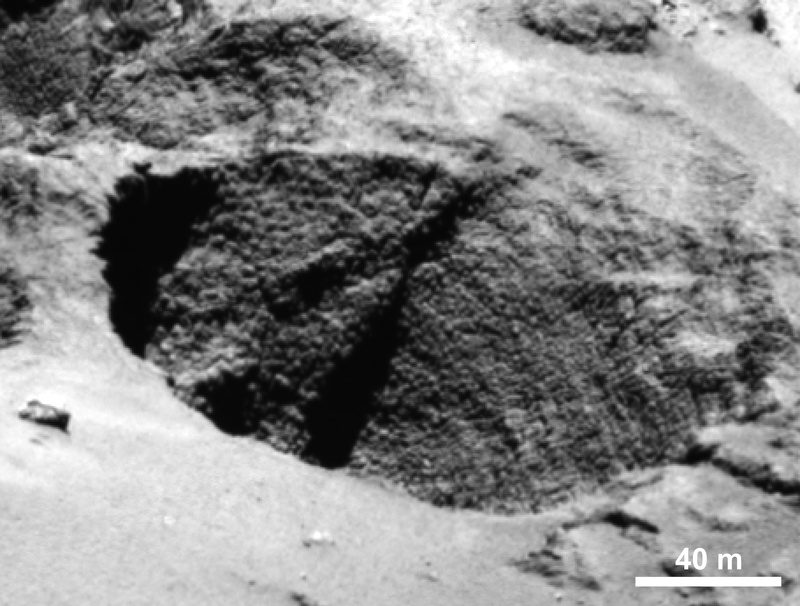 • The comet has a very high porosity of 70–80% with the interior structure likely comprising weakly bonded ice-dust clumps with small void spaces between them. 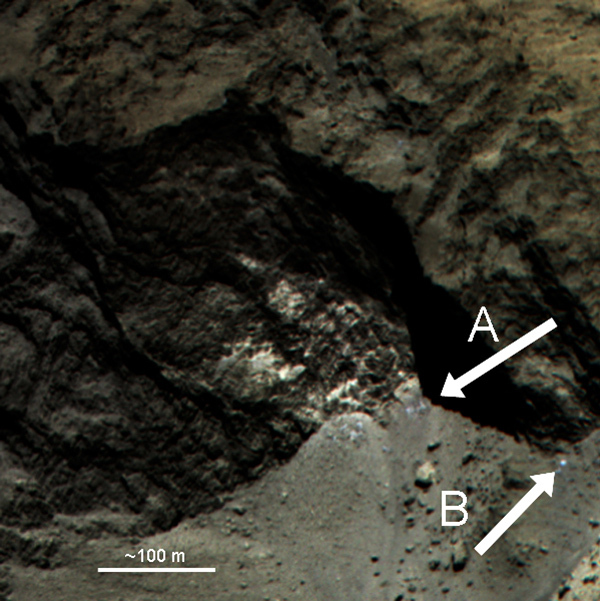 • The dusty covering of the comet may be several meters thick in places. Read about these latest findings on the ESA site here. Want to see even more? (And yes, there’s more.) Visit ESA’s Space in Images page. You could label some of these images as black and white pictures of a plain in Arizona and nobody would know the difference. It’s fascinating how similar they are to places on earth. 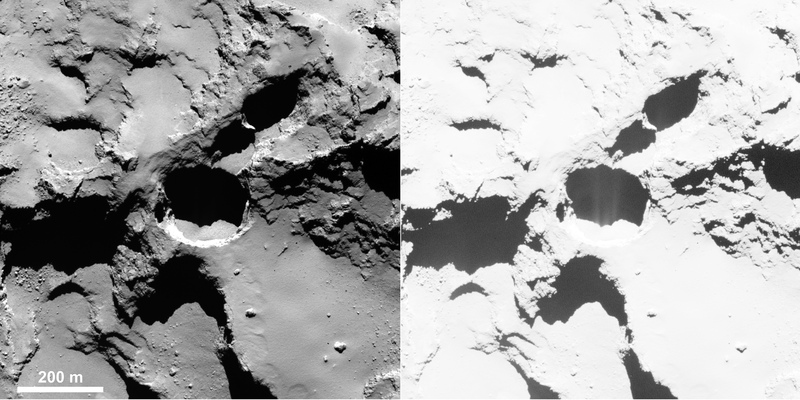 It’s hard to believe that these are images of a comet and not desert hills here on Earth. I’m going to have some fun trying to re-create these images as 3D landscapes with Bryce and Vue on my computer. I knew the harpoon would be a problem, I’ve spent a lot of time in the field and in the workshop/lab with stone and the reliability of modern drilling and metal for stone tools is a random challenge at best… ESA Germany, wrong standard, German tools usually well interested, English treatment still isn’t good enough for them, and they still represent their best work… Glue resin ?